Many industry experts, including The News Funnel’s CEO, Michael Beckerman, are actually predicting that the largest brokerage firms will now be among the more active buyers going forward. The News Funnel and CRE // Tech deal is significant in that it also reflects the consolidation in the content and event space. As more and more tech startups are challenged with gaining traction and market share, The News Funnel saw a significant opportunity in creating a multifaceted platform that ultimately bridges the real estate industry as a whole and the growing tech community. Pierce Neinken, founder of CRE // Tech added, “It’s been an amazing journey building CRE // Tech over the past five years and I could not have done it without the support of so many inspiring people. This has been an incredible community driven effort. Over the years, we’ve received interest and opportunities to acquire CRE // Tech but Michael and his team have demonstrated that they are uniquely positioned to take it to the next level. 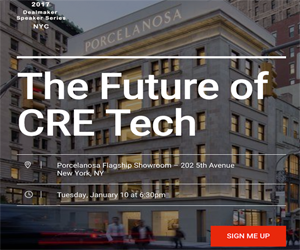 The News Funnel and CRE // Tech share a vision of creating the largest CRE tech community built on innovation and connectivity. I am extremely excited to be working together with their team to take our platform to the next level." Neinken will support the continued growth of CRE // Tech as a Strategic Advisor. The News Funnel is planning on making significant investments in CRE // Tech and will be rolling out many new features and event expansion plans over the coming weeks and months.